Yesterday was the first day that it actually felt like spring. I had the backdoor open as I made a birthday cake for a good friend and it felt amazing. The sun was shining and we hit a glorious 62°, the whole town was in an exceedingly good mood. Today, we’re back to the clouds and drizzle and we’ll be here for a while longer, but it smells like spring, and that is a wonderful thing. I’m ready to start planing the garden again, and the Farmers Market starts up again in a few weeks. I am so eager for early spring veggies that some bright green brussels sprouts made their way home from the Co-op the other day. Have I mentioned lately that I like brussels sprouts? I mean really like them. If I have neglected to mention this fact you’ve probably ascertained it from the number of brussels sprout recipes I post. We really like our miniature cabbages. I can’t think of a better paring for brussels sprouts than bacon. When you put those two independently amazing things together in a hot oven to roast for half an hour, what comes out is early spring perfection on a plate. Preheat the oven to 425 degrees. In a large bowl, whisk together the olive oil and mustards. Add the potatoes, onion, and bacon and toss to coat evenly. Sprinkle lightly with salt, pepper and a few pinches of dried thyme, toss to disperse. Spread the potato mixture on a large cookie sheet or jelly-roll pan, roast for 20 minutes, stirring halfway through. Check the potatoes for doneness and when they are just tender add the brussels sprouts to the pan and toss with potatoes and bacon to coat with rendered bacon fat. Return to the oven to continue roasting for about 15-2o minutes more (stirring once), until the potatoes are cooked through and the bacon is crispy. Just before everything is done you can turn on the broiler to make the edges extra crispy, just be sure to keep an eye on it. Remove from oven and salt to taste. Serve as a side dish or top with a fried egg for a delicious main course. 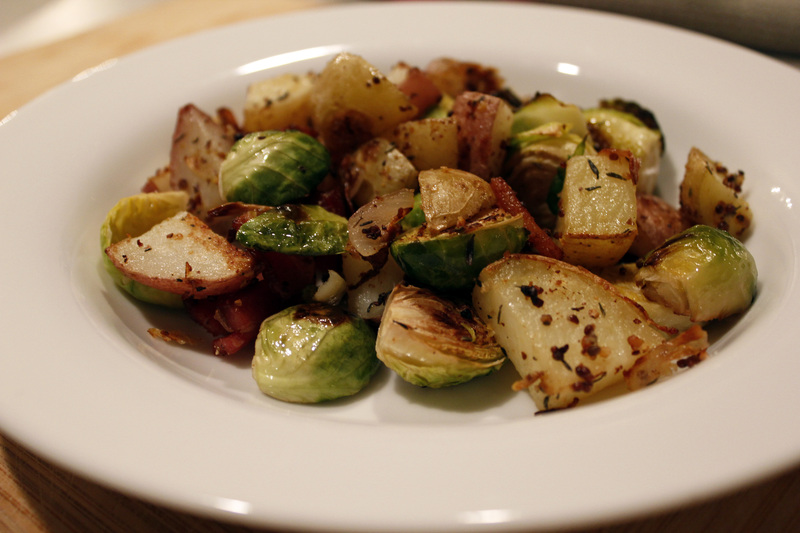 This entry was posted in entree, Quick dinner, Recipe, side dish and tagged Bacon, Brussels Sprouts, Fried Egg, Potatoes, quick-dinner, Recipe. Bookmark the permalink. You know what? I am in the mood to bake potatoes and onions tomorrow for lunch! After reading, it reminds me maybe I should put something green to welcome the spring!